Just like any other respectable sport, angling is not a game in which you have to score to be a winner. Sometimes, just being there to feel the rush of the moment is enough to make it an experience of a lifetime. BLACK BASS. Just mouthing those words gives me a chill of thrill. But it wasn't always like that. I had hitherto thought of these estuary denizens as "just another fish". 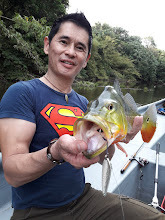 Of course, I was wrong… and I had that erroneous assumption smacked out of me on a recent trip to the amazing black bass stronghold of Sri Ganda in Sabah. The moment I heard from my friend B.C. Bong that the trip was confirmed, I found myself smiling all day long. I'm pretty sure a fair number of fishos would agree that my reaction is a common affliction in the days running up to a fishing trip. And what a trip it was. As it usually is with any fishing venue with a decent population of catchable and sizeable sport fish, getting to Sri Ganda entailed quite a bit of travelling – almost three hours from airport to airport (KL-KK), followed by a numbing six-hour drive, of which the last hour was a tummy-tossing and shaken-not-stirred experience that I won't be forgetting anytime soon. Upon our arrival, we were greeted by a kind, sunny morning and our equally warm homestay host. Despite having just pulled an all-nighter on the road, we quickly freshened up and swiftly assembled our weaponry like a squad of focused commandos on a mission… albeit chattering excitedly like a posse of monkeys about to raid a banana farm. It is said that fishing can bring out the man in a boy. In this case, the reverse happened as Bong and I hastened to load our gear onto the boats and raced the others for the "honour" of being the first to get out on the water. But once away from the jetty, we went our separate ways in search of choice locations amid the expansive area of mangrove swamps, nipah forests and countless tributaries. preteen bass, which was still wearing its adolescent bands. After about twenty minutes, our guide switched the boat engine from a roar to a purr and motored us toward a nipah-lined bank. Some of its tall fronds were stooping in a long curve, just touching the water, as if bowing to greet the two travellers who had come from across the seas. Bong clipped on a white deep-diving lure while I opted for an orange wide-lipped one that would easily do its wiggly dance at two metres. As we came within casting distance, I heard Bong's reel click as he thumbed the release tab in preparation to fire out his lure. I did the same, with the addition of murmuring a salutation to the bass gods, imploring them to be kind and generous. Bong's first cast landed enticingly right at the edge of the nipah roots, where our guide had earlier told us to aim our shots as black bass like to park themselves there to pounce on passing prey. It follows that the closer to the bank the lure is placed, the higher the chances of a strike. But it is no easy task, at least not for a lake angler like me who is used to wide, open spaces to swing my ballistic salvos any which way I like. Here, one has to achieve a low trajectory and shoot the lure between the fronds into the pockets of fishy holes among the gnarly nipah roots, that look like ghastly hands whose sole purpose of existence is to "sangkut" the lure and make the angler look like a total noob. 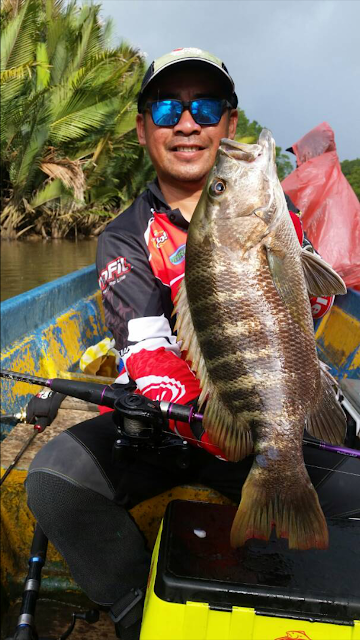 Being a fishing rod designer, tester and acknowledged sifu, Bong was hitting home on most casts while I struggled to find my mojo, snagging on the trees repeatedly and in the process earning the moniker, "branch manager". Sheeesh. We had been there barely fifteen minutes when we heard whooping in the distance. Turning toward the source of the excitement, we saw our friends Retsyl Sylvester and Jay Lubasi doing a kinda rain dance on their boat. One of them had a strike! I couldn't make out who had the hit but man, those two homies were really getting jiggy with it. As I strained my eyes to see better, Bong suddenly made this sound as if the wind had just been biffed out of him. "Oooomph!" I spun around and saw him leaning back against a heavy curve on his rod. Fish on! From the earnest efforts Bong was displaying, it seemed that he was engaging a hard fighter. He wrenched the rod a couple of times in quick succession against the charging load and managed to retrieve some line. But the ferocious finster took it all back with one determined dive, indicated by a sudden forward whip of the rod and a loud hiss from the reel. The fish was clearly making a dash for the roots. It was all Bong could do to just hug the rod and let its recoil action deal with his adversary, while our guide back-pedalled the boat to deny the fish any unintended advantage. For the next five seconds or so, the world around me fell silent. All I could hear was the booming of adrenaline bouncing around in my head. Then, with a deafening splash, the furious fish broke surface just at the edge of the bank. Having blown most of its steam breaking for the roots, the fish seemed more manageable now, although the fight was far from over. Working the rod firmly and retrieving line after every lift, Bong dragged it further from its safe zone. After a series of tense fishing tai chi moves, he raised the fish enough for us to make out the distinctive shape of a black bass. Yes la! Allowing it another few short runs to expend the remainder of its fighting fuel, Bong then steered the mobster to the side of the boat. At just under 3kg, it was a fin-perfect specimen with a full set of the signature fangs, and proud combat colours. Contrary to its name, they are not really black but more of different shades of brown – just perfect for blending with the underwater structure, I guess. After taking its mugshot for the offence of assault on Bong's lure, it was slid back into the water and grudgingly swam off. This junior brat sustained a hole in the lip when it tried to draw first blood from Bong. Having had such a good start, we were feeling optimistic about the colour of our day. But it wasn't until past noon that we met another belligerent bass that took exception to the two of us repeatedly thrashing the water on its turf with our lures. Black bass are known for their ferocity and whether this one was hungry or not was probably irrelevant. As Bong made a careful cast toward a hole along the snaggy bank, his lure landed on a partially submerged protruding branch. He gingerly tugged it free and just as it plopped into the river, a finned marauder burst out of the water and climbed onto his lure mouth-first. The resulting heart-stopping splash stunned us both silly and while Bong recovered enough to fire off a retaliatory whip of the rod, I fumbled to press the correct button on the camera. The fish instinctively turned around and made for the roots with a blistering tailbeat that sent a half-pint of spray three feet in the air… and it was just getting started. It was a good thing that after his tussle with the earlier bass, Bong had opted to arm himself with the sturdier of the two rods he brought. With that big stick in hand, he thumbed the spool on his reel to prevent it from paying out line and slammed the rod in a malicious side-sweep that stopped the hooked hooligan from going in. Not to be outdone, the fish dove down instead. In one pounding dive, it brought Bong's arms down about thirty degrees, rocking the boat in the process. If it kept going, chances are it would be able to find something sinister close to the bottom to wrap the line around. Using some of his Muay Thai prowess, Bong high-sticked the rod. With the fish going straight down right in front of him, the stress angle on the rod put it at great risk of breaking. But it needed to be done. It turned out to be the right move, as the fish was forced to turn its head skywards and Bong quickly reclaimed some line… just a few feet, but it was enough to swing the balance of the fight in his favour. As the fish rose, it seemed disoriented and dashed away from the bank instead of towards it. Although we could see it still had plenty of fury, it was pretty obvious from then on that Bong would own this ferral fish. After a series of respectable throttles and dives, the brute of a bass rolled up to the surface in surrender, showing its muscular darkened bronze physique to the two of us who just stared at it while sun-tanning our tongues. Bong then claimed his privilege of posing with the water warrior, whose armour-like scales rendered it a majestic presence although it was a captive. Just like wild boars, black bass (BB for short) lose their stripes and bands as they grow bigger… and heck yeah, this one was huge. It occurred to me that if Bong's catches kept increasing in size, then his next strike could haul in one helluva slab. Perhaps it was the law of attraction, or maybe it was his lucky socks (sand flies, you know), but later that day, we would experience some of the magic that all anglers swear exists in our "religion". After a brief lunch on board at a shaded little nook among the nipah palms, our guide revved us to a spot with a sunken dead tree partially sticking out of the water. They call such places "rebah", which means "fallen", referring to the trees. It's a common fact that such "fish condos" are high-yield spots, with an obliging resident or two ever ready to chomp on your lure. We wasted no time peppering the water around the piscatorial mansion with our barbed projectiles, casting as close as possible to the branches. On my sixth cast or so, I felt a thud on the line and a load zipping away from me. Without even sending a command to my brain, my arms slashed the rod upwards in a reflex strike, a conditioned response ingrained in most fishos. I felt a moving weight, confirming I had a fish on. But I was using a heavy ensemble meant for kingpin bass, and with a few casual flicks of the rod and some effortless cranks of the reel, my unfortunate opponent was dragged from its dining table and came skimming up to the boat. 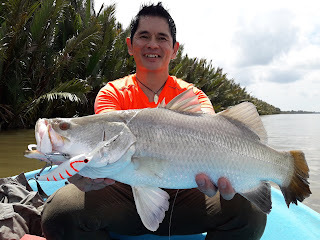 It was a feisty mangrove jack, commonly called "MJ". Not bad, but a long way from good. Although black bass are mandatory catch-and-release bounty in Sri Ganda, our guide said we could keep my MJ for the table if we wanted. Encouraged that I had broken out of my "fishless bubble", my efforts in the next couple of hours were positive, enthusiastic and relentless. My toothy MJ looking very displeased about the dental accessories that came with its meal. After Bong caught another MJ and a BB not worth mentioning stacked against his earlier titan, we arrived at a stretch where the flow was quite swift as the tide had just began to turn. I hadn't caught anything since that skipping jack, and thinking it may have to do with my accessories, Bong handed me one of his "charmed" lures. I clipped it on and chucked it around a bit before I saw a promising hole with calmer waters that looked like it was formed after some monster took a big bite out of the bank. As soon as the boat lined up to the spot, I shot off a cautious cast, being mindful of the overhanging palm fronds. If I snagged the lure, we'd have to boat in to retrieve it and that would spook whatever is in there and spoil the swim. I exhaled in relief and anticipation as my luminous pearl-coloured lure landed precisely at the inner edge of the hole. It made an enticing splash, as if it was something tasty that just fell from the branches above. I whipped the rod downward a bit to give the line a little snap and make the lure dive, then commenced a slow retrieve. I had barely done three feet when a forceful tug nearly ripped the rod from my hands. My fingers locked instantly in a white-knuckled grip and the reflex swish kicked in again. Strike! The fish was obviously enraged that the meal it had just bit into had bitten it back, and it held nothing back in showing its displeasure. It tried burrowing into the maze of nipah roots but I foiled its attempts with some unfriendly stick work. The seething speedster then tried to rip off with a turbocharged sprint, but the hard setting on my reel and the 40lb braided line twanged it back. Just when I thought it was out of tricks and that I had the upper hand, the scaled scoundrel blasted itself clear out of the water in a defiant display of insolence. A siakap! As it crashed back into the water, I cranked feverishly to tighten the line it had slackened with that acrobatic move. But just as I fixed that… pooom, it took to the air again… and again. Had I not been using a high gear ratio reel, I'm pretty sure I would have lost it on that second leap. But all that jumping and head-shaking must have been awfully draining because half a minute later, my silvery sparring opponent came in meekly. It was an unimpressive catch for me, both in size and species, as I have caught much larger specimens before. But then our guide starting gushing about what a spectacularly rare catch it was in these waters. 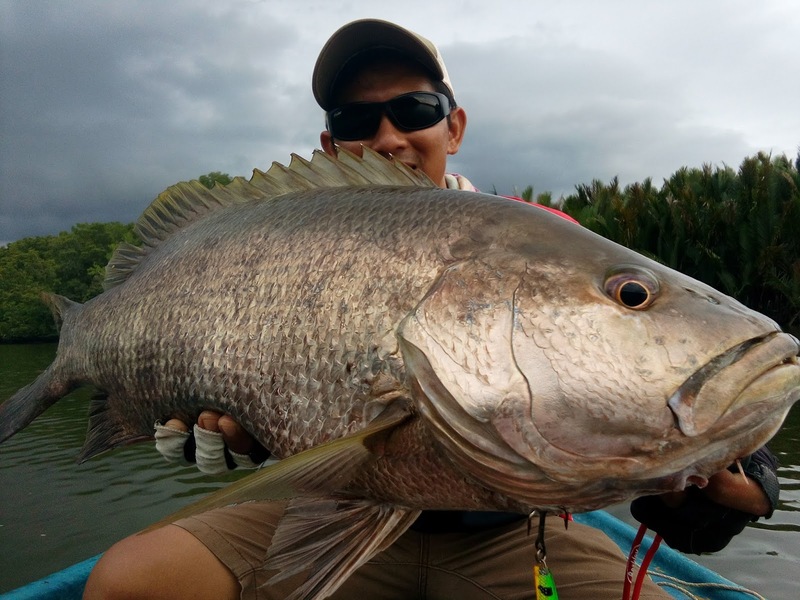 On the list of compulsory catch-and-release species, siakap sit way up there… even above black bass! He went on to say that in all his years as an angling guide in Sri Ganda, he has never seen one boated on rod and line. "You'll be a celebrity… a legend," he said. What? Really? Well ok, I could get used to that☺️. Apparently, my silver medal was worth its weight in gold at Sri Ganda. Our guide said the tattered tail was a result of it being nipped by buntal (puffer fish). After that dose of feel-good serum, it wouldn't have mattered to me whether we caught anything else that day. But magic was about to happen. It was already evening and the tide was really on the move. We arrived at a river that was shallower than the previous one, obvious from the extremely swift topwater rush. The plan was to motor upriver and then cast to the banks while drifting down, but it wasn't that easy. The flow was really fast and most times, we would only get one shot at a good spot before we whizzed past. We had to cast quickly, retrieve fast, wait for the boat to line up… repeat. It was really hectic moving around so quickly and we were soon breaking out in buckets of sweat. It was amid all that chaos that a savage bandit took a liking to Bong's lure and crunched on it with such force that he was almost pulled off the boat. In a fortunate fluke, his backward motion to balance himself also served as a potent strike… and the fish was not happy. "Big bass!" said our guide, pointing to the creaking curve on the rod. Bong staggered around a bit as he grappled with his rod that seemed to have formed an alliance with the fish to give him a hard time. But it didn't seem to me that he was in an insurmountable situation. 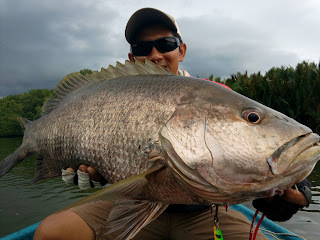 In fact, the beefy bass gave Bong an inadvertent advantage by choosing to have their duel out in the fast current instead of among the nasty nipah roots. It must have thought the forceful flow would aid its powerful thrusts away from us. But hello… we were on a boat, and could easily follow it wherever it went. By the time the fish realised its folly and turned for the bank, it was futile, as it now needed to move against Bong and the water to get there. Its "Plan B" was to circle the boat, an effective maneuver for the fish and a potentially dangerous one for those on board. The line could get cut on the oars, propeller or anything sticking out past the gunwale, while stuff and people could be knocked overboard as the keyed-up engaging angler moves around quickly to deal with the rampaging fish. I sat absolutely still amidships while our guide paddled attentively to counter the shift in balance each time Bong pumped the rod or was forced into a stoop by the power of a burning run. He used every known move to secure victory in exactly such a situation, and the kraken reciprocated with a matching response each time. But I could tell the intensity was softening on both sides, which was a good thing. All Bong needed to do was to "layan" the fish and let its tantrum fizzle out. When he had retrieved almost all the stolen line, I craned my neck slightly to peek at the rising gangster, still not daring to move lest I tip the boat over. A shimmering huge shape slowly came into view… a humongous head with glaring eyeballs that seemed intimidating even on the brink of defeat. When its entire body slid up to the surface, the voices in my head screamed: "Yaaaaassssss!!!" Bong maintained a tight line to keep the fish steady while our guide and I got into position. It would take the both of us to boat this brawny bass. After a few nerve-wracking failed attempts during which the thrashing thug gave us all a salty bath, our guide finally managed to slide the thumping trophy on board. High-fives flew liberally and Bong proudly sat at the stern while the fish was placed on his lap for the honour pics. He managed to lift it for a couple of macho shots, but only barely, as his arms quivered under its heft. It was the biggest, baddest black bass I have ever seen. Oh wait… prior to this trip, I'd never even seen one before. But yeah, it was huge. to lift his bouncer of a bass for a picture. Back at the homestay, the atmosphere was akin to a Viking party as tales of the day's foray were loudly exchanged. There was a roar of admiration when it was related that on his way back, Jay had boated a 9kg beauty hardly 200m from the jetty. Bong also received more than a fair share of pats on the back while I, too, held my own on account of the silver slab I caught. True to our guide's word, I was accorded celebrity status. As everyone was agreeing what a great day it had been, the conversation naturally turned to the subject of organising another trip here. "Okay," an eager voice replied. "Let's make it sometime within the next two months." back to the jetty after he called it a day.